In a week when the moon has been all over the news and dominated the social media conversation, we take a look back at Neil Armstrong’s photograph of fellow astronaut Edwin ‘Buzz’ Aldrin on the lunar surface. It’s the definitive image of humankind’s most spectacular feat of exploration: the first manned mission to the moon. More than 40 years after the event, it remains an iconic image of human achievement in the 20th century. The drive to achieve this goal was given greater urgency by the intense Cold War rivalry with the Soviet Union. Although the Soviets had a significant space programme that had already succeeded in sending both the first satellite and the first cosmonaut into space, the Americans believed they could beat them in the race to the moon. On 16 July 1969, after preparatory work done during earlier Apollo missions, the US Space Agency NASA launched Apollo 11 from the Kennedy Space Center in Florida. Four days later, crew members Neil Armstrong and Buzz Aldrin descended to the lunar surface in the Lunar Module, Eagle, and became the first humans to walk on the moon. Meanwhile, the third crew member, Michael Collins, orbited the moon in the Command Module Columbia. The intense international focus on the mission resulted in the moon landing being watched live on television by a record-breaking 500 million people worldwide. In addition to these black & white film images, however, high-quality colour photographs were a vital part of recording the mission. The still camera developed for use on the Moon was the Hasselblad EDC (Electric Data Camera) that had been specially adapted from the motorised Hasselblad 500 EL. It used 70mm film and had no viewfinder. The camera was fitted with a specially designed 60mm Biogon lens and had a polarising filter attached to the front. The astronauts carried the camera mounted on their chest and pressed the shutter release while estimating what was visible through the lens. Before going on the mission, they were each given a camera to take home and practise their technique. All the still photographs shot on the Apollo 11 mission were captured with the Hasselblad EDC and all have the distinctive reference crosses at intervals across the frame. These crosses (or fiducials) were imprinted on a glass plate known as a reseau plate, which was placed behind the lens and directly next to the film plane. The crosses were used as a basis for measuring objects and for correcting any distortions in an image. The astounding photographs shot during the Apollo 11 mission showed scenes that had never been previously seen. While alone in the Columbia, Michael Collins photographed the earth rising over the moon and the Eagle descending to the moon’s surface. 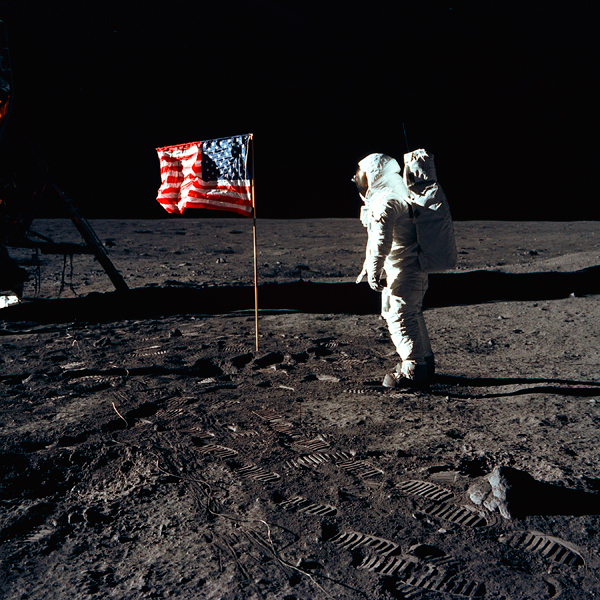 After landing in the Sea of Tranquility and taking those first momentous steps, Neil Armstrong and Buzz Aldrin photographed a variety of scenes, from the planting of an American flag to footprints in the dust. The most famous image is a full-length portrait of Aldrin facing the camera. Behind him is the curved surface of the moon and beyond that the blackness of space. The fact that it shows a human being walking on the moon is enough to make it a stunning picture, but there’s a further level to the image. In the visor on Aldrin’s helmet we see the tinted and distorted reflection of what he saw – the Lunar Module, Armstrong taking the picture and Aldrin’s own shadow on what he described as the ‘magnificent desolation’ of the surface. The replacement of Aldrin’s face with this lunar scene symbolises the way technology had raised the astronauts to an almost robotic, superhuman level. 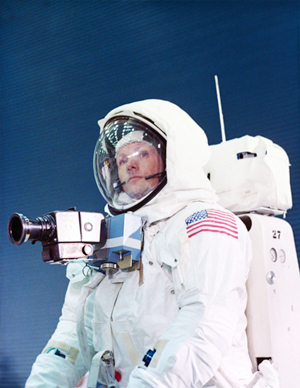 The Hasselblad EDCs used on the surface of the moon were left there to reduce weight at the end of the mission. The only items taken back into the Lunar Module were the film magazines containing the undeveloped images and around 22kg (48lb) of lunar rock. After lifting off from the lunar surface, the Eagle completed its rendezvous with Columbia and returned to earth on 24 July. After their return, the three astronauts were kept in quarantine for three weeks and acclaimed as national heroes when officially released. The highly prized mission photographs were originally published in the December 1969 issue of National Geographic magazine and Armstrong’s photograph of Aldrin was chosen for the cover. It has remained the defining image of the momentous Apollo 11 mission ever since.